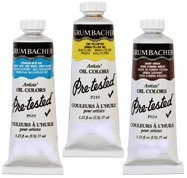 Pre-Tested® is the name of Grumbacher's professional range of oil colors. It's also the name for a philosophy that permeates the way we manufacture all of our products. Everything we make is tested again and again at every stage of its existence. Our time-proven formulas are fine-tuned through independent laboratory tests as well as hands-on trial by professional artists. We specify the best ingredients available, putting every new one through a rigorous selection process. We test samples of each and every batch of raw material before we allow our vendors to make shipments. On the factory floor, we sample batches in process. And finally, even after our products are in the field, we continue to track batches and test for quality, performance and shelf life. Pre-Tested is Grumbacher's flagship. It's the product that, more than any other, represents the way we do business: with care, precision, attention to detail-taking nothing for granted. On a more specific level, it means simply the finest pigments the world can offer, milled in select alkali-refined linseed oil for the professional artist. Pre-Tested stands for optimal color development, high chroma, superior tinting strength, excellent adhesion, outstanding working properties and archival quality. 90 colors, 1.25 fluid ounce (37 ml) tubes. Whites and Ivory Black also available in 5.07 fluid ounce (150 ml) tubes. Made in the U.S.A.